In Italy, in the 15th century, the Renaissance emporium represents the heart of scientific knowledge and artistic sense. The practical knowledge together with the latest optical and mathematic theories flow there. The sharing of knowledge and the uniformity of taste produce miracles, including the collective achievement for the Cappella Sistina decoration in 1482, where different artists worked all together. What we see today is a homogeneous product – the result of a deep cultural affinity born from a shared research within compact geographic areas with the same social organization and productive purposes. Antonio Forcellino, architect, restorer and writer, he restored some of the major pieces of Renaissance Italian art: Michelagelo’s grave for Giulio II in San Pietro in Vincoli in Rome, the facade of Pinturicchio’s Libreria Piccolomini and Michelangelo’s Altre Piccolomini in the Dome of Siena. 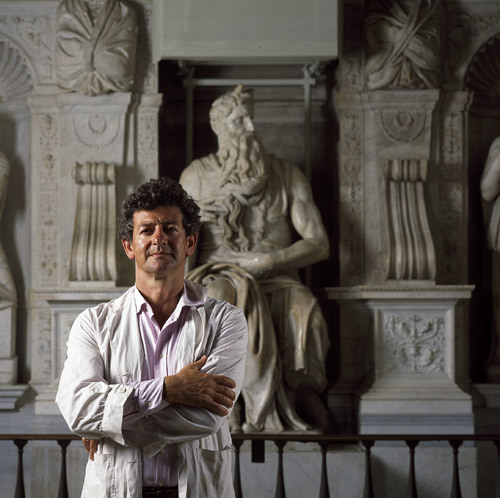 His essays include the biographies of the three major Italian artists: Michelangelo. Una vita inquieta (Laterza, 2005), Raffaello. Una vita felice (Laterza, 2008), Leonardo. Genio senza pace (Laterza, 2016), being translated into the principal foreign languages. By the end of August the historical book Il cavallo di bronzo. L’avventura di Leonardo, first volume of the trilogy Il secolo dei Giganti, will be published by HarperCollins Italia.